Thanks for that link the articles really made me think a lot and I liked the interactive map. I'd say that climate change is evident where I'm from.... the landscape clearly shows it and our football field at the local high school is dying because of the lack of rain and higher than normal temperatures. Another year of low ice cover in the Arctic. So what's new? Few know about this and fewer care. The decline has been going on so long that we fail to be shocked anymore. In the graph below the gray area is where 95% of years should fall. We are well below that area, yet again, about where we were last year. The dashed line is 2012 when we experienced the lowest sea ice cover (in September). Depending on the vagaries of the weather, this year may or may not be the lowest on record but just looking at the area of cover is misleading, since it tells you nothing about the thickness of the ice. As the ice cover expands in the cold Arctic winter it covers the ocean and traps the heat it contains. This allows the air temperatures to drop very low above the ice. Think of the ice as the covers on your bed. If your covers are thick your body heat stays contained even on a cold night. If you have just a thin sheet you don't stay quite so comfortable. 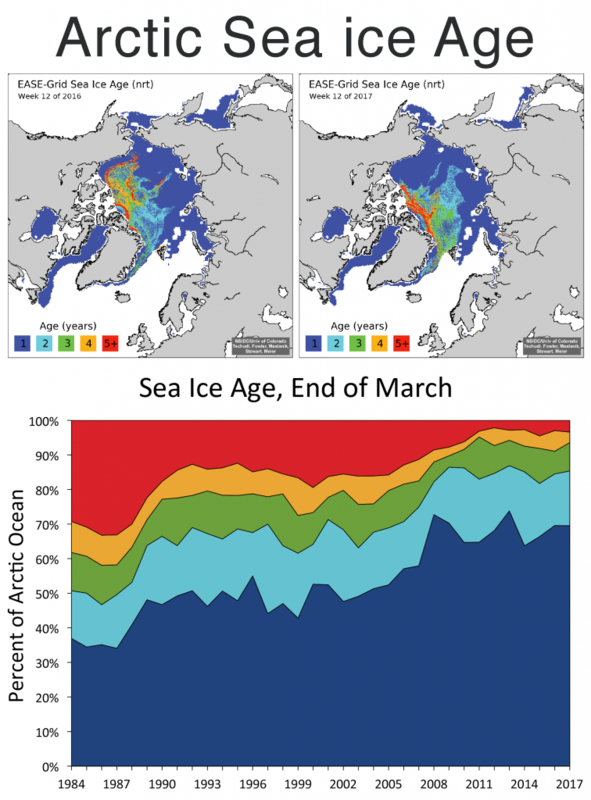 In the Arctic, sea ice gets thicker the older it gets as it goes through successive winters. As recently as the 80s, 30% or more of the ice cover was 5+ years old and first year ice was not much different at about 35% of the area. 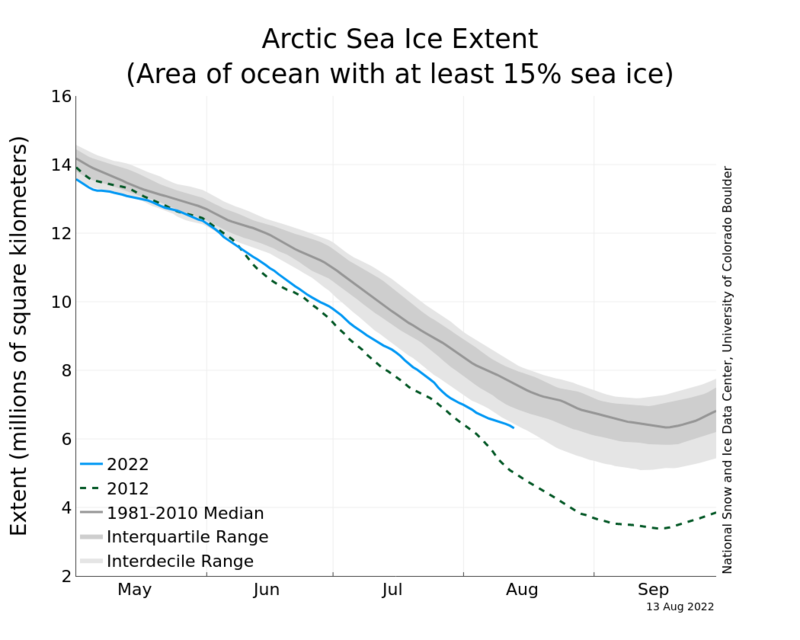 Now, older ice area has been reduced to <5% while first year ice makes up nearly 70% of the area. Thin ice breaks easier during Arctic storms and, much like crushed ice in your drinks, melts faster. Open water in the Arctic summer enjoys 24 hours a day of sunlight. Ice reflects most of the heat, but open water absorbs almost all of it. This makes the Arctic ocean warm more and more year after year, which in turn makes the formation of new ice in teh winter harder and harder until later in the year, after enough heat escapes the surface waters. That heat plays havoc with the regional weather in the Arctic. The Polar Vortex is weaker and slower to form making it more likely that cold Arctic air will spill out in bursts across North America and Europe. 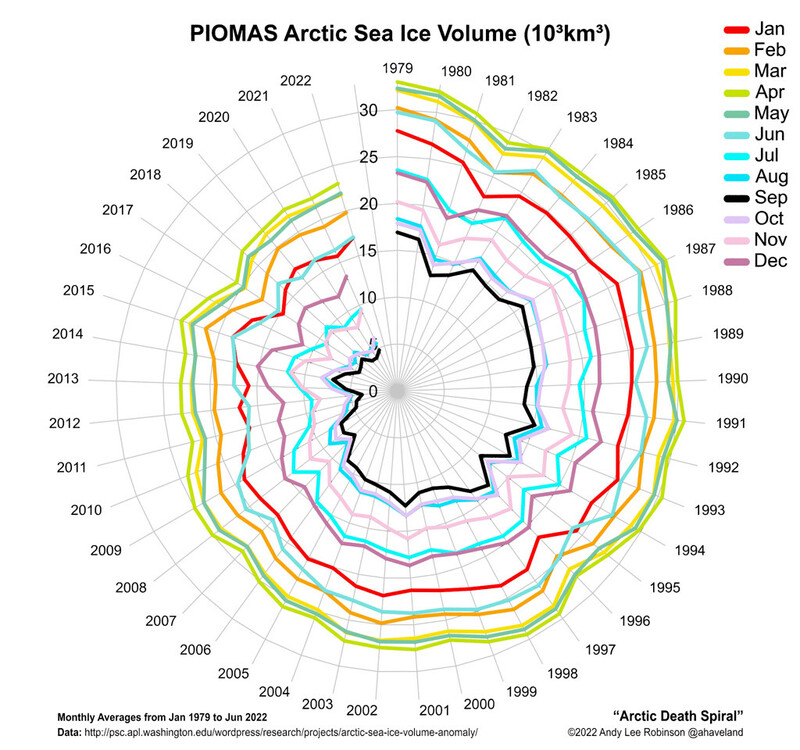 The 'death spiral' map shows how sea ice volume is circling the drain that will one day, in the not too distant future, end with an ice-free Arctic summer. How much ice have we lost in the last 4 decades? Comparing April 2017 to April 1979, the reduced volume of Arctic sea ice would be nearly enough to cover the entire combined land area of both Canada and the United States with 1 meter of solid ice. Take the average minimum extent from the earliest period that we have data for, then calculate how far out on a normal distribution the 2017 ice coverage minimum is in comparison. If it is +2 SD, then take the average pro-football winning football score, and figure out what the +2 SD equivalent is. I'm too time pressed to dig for the football stats right now, but the average winning score is 29 points. I'd bet that the minimum ice coverage loss equivalent for a winning football score is around 70 or 80 points. Then if this message is emphasized by the mainstream media (eye-roll), then just maybe people can understand the extremity of the changes that are now afoot. If indeed we are entering a process of abrupt non-linear climate change (as I suspect/fear), then Guy McPherson is thoroughly vindicated, and we are left with having to be personally satisfied with merely doing the right thing, rather than thinking that there will be any real beneficial outcomes to our actions. Looking at this data and thinking about positive feedback loops that are now engaging, it is very possible that we are right now beyond the reach of even a Marshall-plan like response. Even this would not "thoroughly" vindicate GM. GM's hypotheses are based, in large part, on flawed interpretations of the science and an over-reliance on some anonymous poster (or set of posters) named Sam Carana, who is not averse to, effectively, making stuff up. The notion of non-linear changes have been posited by the IPCC for a long time. We might well be entering such a phase (I don't know) but that does not translate into McPherson's opinion of total extinction by mid-century (or earlier). So, no, it would not vindicate GM. Tony - I never know what to think about the Arctic News website myself, so am interested in all opinions/thoughts. I read it often (among other AGW sites) but am left with an agreement with myself to both not fully believe it and yet not dismiss outright. There are dual tendencies at work when trying to make heads or tails of this stuff - on one hand, the tendency for hyperbole just to make waves and get peoples attention, or simply to indulge an individual's emotional blind spot of self-righteous misanthropy; and on the other hand the tendency to dismiss predictions of the most adverse of outcomes on the basis of the disagreeableness of where the data is pointing. I don't have the time to dive deeply into the scientific sausage making behind sites like Arctic News, so am left with opinions of others and my own pondering. One only has to look at the frequency of Carana's taking a short period of data points and extrapolating, only for the projections to be falsified by the next period of data. Carana leaps on such periods only to pander to the doomers. He or she is also not averse to mixing datasets in one graph or to graph out data points that aren't actually data points. Of course, there will always be the odd bit of interesting opinion amongst all of that but you will rarely, if ever, see critical comments in the comments section, because they don't get published (I've tried many times). No, if you want reasonably accurate news about the Arctic, try Neven's blog. He's not as prolific as Carana, but there are also some interesting discussions in the comments sections of posts, and in the related forum. Deniers and contrarians have been relying on data series that don't measure surface warming, which, for the lower troposphere, have shown a smaller warming trend than surface measurements. The RSS TMT data set was corrected a couple of years ago and now it's the RSS TLT data set. Well, once biases have been removed, TLT shows an even stronger warming than surface records, though still not as strong as some models suggest. I'm now waiting for the usual suspects to tell us why this is a conspiracy or why their last remaining hope, the UAH TLT data set (currently still in a beta version), is a far better measure. I'm not sure what data set Mark and Stan agreed on for their bet but it's sure starting to look like a lost cause for Stan. Here's a new data point. Record dry spell out here in on the West Coast. Now it's burning. This recent paper by Benestad, et al, examines many contrarian papers (the ones outside the 97% concensus) and explains the errors in them. Perhaps the contrarians ought to now examine this paper to see if there are errors in the analysis? What do we think? apologies if this has already been discussed or shown, big thread to get through! Not dead yet... Actually I have been in the midst of an extended relocation, hence my disappearance from this thread. In any case, for those interested, the apparently imminent eruption of Mt. Agung on the island of Bali in Indonesia is potentially going to be globally important for climate in the next few years. The last time Agung erupted was in 1963 and it resulted in a 0.1 to 0.4 C reduction in global temperatures over the next two years. In comparison, Mt. Pinatubo in the Philippines cooled things by 0.5C for 2 years after the 1991 eruption. It is uncertain how big this upcoming eruption will be as of yet. In order for an eruption to become climatically significant it needs to inject materials (especially sulfur dioxide) into the stratosphere. In the tropics that means the eruption needs to push materials higher than 16 km. If the eruption height is in the 20-25km range then we will likely have globally significant effects on climate. For a volcanic eruption to have global impacts it has to be in the tropics since equatorial eruptions can spread aerosols into both hemispheres. Unless we get a massive eruption (think Tambora in 1815 = Year without a summer) then the regional climate impacts will probably be relatively mild, though potentially nontrivial. Primarily over continental regions of the northern hemisphere, summers will be cooler (max effect at around 40 degrees latitude) while a stronger Polar Vortex will yield warmer winters for a couple years. If things mimic the Pinatubo eruption then most of North America, Europe and Siberia will be much warmer in the winter while Alaska, Greenland, the Middle East and China will be cold. The southern hemisphere sees less magnitude of impacts because of the relatively greater amount of ocean (releases heat), but the impacts last longer. Within two years the eruption climate effects will appear to be over but there will be a sort of echo in the climate system that can last for decades caused by the cooling of ocean waters during the period when volcanic aerosols block some of the sunlight. This could help reduce the absolute rate of warming for a while but not enough to dramatically change our future climate projections from greenhouse gas warming. Good to see you back, Mark, and good luck in Indonesia. Maybe a few big volcanic eruptions close together will give us some respite. With news of recent research showing tropical forests are now a net source of emissions and that methane emissions from livestock are 11% higher than estimated, it seems like it's game over for humans versus nature. Nature will win, of course, but humans will have left their mark on it, perhaps for ever, if any nature survives. It's rather ironic that this research comes around the time that the latest estimates of emissions from energy show a continued stalling or slowing. We just can't stop ourselves from ensuring that atmospheric carbon continues to accelerate. This is because the environment always comes second to the economy for most people. Oh well, it's oddly enthralling how we can't seem to help ourselves and even still have those who feel they need to pretend that there's nothing wrong or that what is wrong is easily manageable. I heard a fact twice recently, that I hadn't heard before: humans and their animals (for pets or food or other pleasure) now constitute 98% of the animal biomass on this planet, pretty much the reverse of how it used to be. Perhaps that illustrates just how f*d up we are. I heard one of the lead authors speak this evening. I challenged him to live up to the standard he set for others regarding claims. To quote you...... "Stan, if you have any credible source(s) for this statement please provide it/them. Otherwise retract your assertion or qualify it as solely an unsupported opinion that you seem to hold regardless of scientific observations to the contrary." The law of very large numbers, as I read in an explanation, applies to non dependent random events where all the possible outcomes of each occurrence of the event are known. In his original claim he provided a link to a wiki page on LLN, ( you should be able to click on the link in his claim quoted above) and in it states what LLN applies to. How he got from Wiki's definition to “ they only apply to discrete numbers or that all possible values must be predetermined.” I don't understand, and he provided no source backing such a definition. Despite my attempts, Mark has so far been unable to see how logically flawed his claim is. Who am I and why should anyone believe what I have to say on this subject? Well, I post under my real name so any search engine will pull me up on top. I am a research scientist and professor with an environmental engineering degree from MIT and a doctorate in ecology from Penn State. I am what is termed an 'interdisciplinary' scientist which means someone who works across many scientific fields. This gives me a broader view than many of my colleagues on issues such as climate change. I teach graduate classes on the subject but also have taught it to middle schoolers, at open venues, a local church, and through newspaper editorials. I am gobsmacked that a person that said that of himself could come up with and defend such an illogical argument to back his claim. It is not the only logically flawed argument he has presented in this thread, but it is certainly one of the most glaringly obvious. How can he and his believers fail to see the illogic in his statements? Who can see the illogic of his argument? I missed this paper, last year, by Rockström et al, which outlines the challenge presented by the Paris Agreement goals. With no meaningful action to mitigate yet visible, it seems highly unlikely that we'll manage to meet even the weakest of those Paris goals. The scale of the decarbonisation challenge to meet the Paris Agreement is underplayed in the public arena. It will require precipitous emissions reductions within 40 years and a new carbon sink on the scale of the ocean sink. Even then, the world is extremely likely to overshoot. A catastrophic failure of policy, for example, waiting another decade for transformative policy and full commitments to fossil-free economies, will have irreversible and deleterious repercussions for humanity's remaining time on Earth. Only a global zero carbon roadmap will put the world on a course to phase-out greenhouse gas emissions and create the essential carbon sinks for Earth-system stability, without which, world prosperity is not possible. So far, the ash plume is only reported to be 7.6 KM at highest. Time to pay attention to this. Nice. Not a million miles away from my own journey from denier to realist. But it seems to be so rare to find people going that way. The best global temperature measurements that we have are not showing an alarming rate of increase for nearly four decades now. Further, it is unlikely that the warming that has occurred is entirely due to human causes. The entire article is available here. We identify and remove the main natural perturbations (e.g. volcanic activity, ENSOs) from the global mean lower tropospheric temperatures (TLT) over January 1979 - June 2017 to estimate the underlying, potentially human-forced trend. The unaltered value is +0.155 K dec while the adjusted trend is +0.096 K dec, related primarily to the removal of volcanic cooling in the early part of the record. This is essentially the same value we determined in 1994 (+0.09 K dec, Christy and McNider, 1994) using only 15 years of data. If the warming rate of +0.096 K dec represents the net TLT response to increasing greenhouse radiative forcings, this implies that the TLT tropospheric transient climate response (ΔTLT at the time CO2 doubles) is +1.10 ± 0.26 K which is about half of the average of the IPCC AR5 climate models of 2.31 ± 0.20 K. Assuming that the net remaining unknown internal and external natural forcing over this period is near zero, the mismatch since 1979 between observations and CMIP-5 model values suggests that excessive sensitivity to enhanced radiative forcing in the models can be appreciable. The tropical region is mainly responsible for this discrepancy suggesting processes that are the likely sources of the extra sensitivity are (a) the parameterized hydrology of the deep atmosphere, (b) the parameterized heat-partitioning at the ocean-atmosphere interface and/or (c) unknown natural variations. But, finally, in the spirit of Feynman, I would offer a wager that the earth will be cooler in the next decade, beginning today, than it was in the decade previous to this day. If we are still around in ten years, maybe we can laugh at the outcome. This seems such a huge average monthly anomaly difference that I'm sure I haven't done this correctly. Can someone confirm? Maybe the LibreCalc summation isn't working right. If right, then Stan owes Mark some Guiness. Still, that's a large increase, even with part of 1998 included. Did I get it wrong? If not, what are your thoughts now? Would you have offered the bet if you knew then what you know now? In Climate Change, focusing on Global Average temperature is like focusing on the price of Bitcoin or gold. You will completely miss it, the big IT. It's about value (of the habitat) gentlmen. Holding value. Gold, The price is only important as a measure (messaging) of how much you need to buy/sell to maintain 10% in your portfolio. So, climate, are you lossing or gaining habitat and or increasing/decreasing crop yields. In the end we gotta eat and most of what we eat depends on three crops. Do you know which ones and where they can grow? Meanwhile, back in the memory jungle. This is The Definitive Global Climate Change (aka Global Warming) Thread. So global average temperature anomalies are a big feature of that, hence such discussion. The goal of controling the weather as a weapon has been achieved. Check out HAARP and the many other ionispehere heaters as well as solar radiation management through high altitute aerosol spraying by several governments that has been perfected over the last two decades. Lots of information can be found at geoengineeringwatch.org. Investigate and spread the word to stop this damage to the atomosphere.